At Cement Tile Shop, we have a huge passion for beautiful encaustic cement tile. Encaustic cement tile is a great way to show off your personality and style in any residential or commercial application on both walls and floors. As America's leading supplier of handmade cement tile, we have supplied thousands of projects successfully with a proven track record of delivering quality material. We offer in-stock patterns and solid colors as well as special order material. Since all patterns are handcrafted, each design can be customized and created to your exact color specifications. Our factories are the best in the business. As a 2018 Houzz award winner for customer service, we would be glad to answer any questions you may have or assist you with your cement tile project. Browse our social media, projects or blog for inspiration from recent commercial and residential projects or use our Room Visualizer and Tile Customizer to try out the patterns of your choice. Have as much fun shopping as we did creating our products! With our revolutionary Cement Tile Shop Room Visualizer you can now apply our cement tiles to a room scene or even upload your own room. Click on the image below to get started on your dream room! 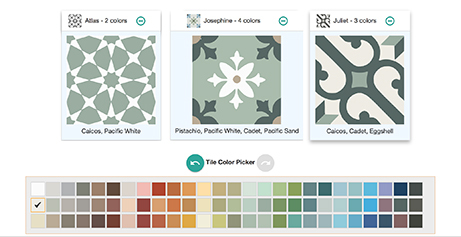 Our unique Tile Customizer allows you to take any of our cement tile patterns and customize them in the colors of your choice. Once customized, save your choices for future use, share on social media or via email, or easily submit a request for a quote. Click on the image below to begin, the possibilities are endless!